This post is part of a linky party over at ihearttuesdays. Check out the other great posts with the theme 'handwritten' here. There's a valley in the Northern Rivers region of NSW called the Clarence Valley. In the valley is the small town of Old Bonalbo. Population 240, though there would be lucky to be 50 houses in the town itself. About 10 km up the road is a small farm. It wasn't always this small, but over the generations it has been whittled down to just a couple of hundred acres. I've been dreaming of this place for 30 years. As you may remember, as a little girl my family and I lived on a boat and sailed the world. While we were exploring the great cities and cultures of the world, I was thinking of Old Bonalbo. Population 240. I remember saying to my mother "one day I'm going to go and live there. And breed horses." "It's miles from anywhere" she said. I know it didnt make sense. I had never been there. I had never been on a horse. I was about the age my daughter is now. I smile now when I hear Ingrid begging for a horse. I remember the pull, the lure of the land, of that particular piece of country so clearly. Sometimes I still close my eyes and imagine myself there, just as I did as a small girl. I like the idea of my children being the 5th generation to live and work this land. I think they do too. The last person to live there was my great aunt Jean. As a young woman she was beautiful, strong, the life of the party and had the most magical way with horses. Old cockies in the district still talk of her horsemanship skills, and of her brothers (including my grandfather) stockmanship. Like others, Jean wasn't the same after war. Some of the things she experienced as an army nurse never left her. Jean never married. Not for want of suitors either. Jean told me of one proposal. She said he was "good looking, and had a lot of cattle. And good cattle too. But I just didn't feel like it". If she were here today she would have been 107 years old. ANZAC day marks the 10th anniversary of Jeans death. ANZAC day was the most important day in her calendar. In her latter years, she would sit on the verandah of the Urbenville nursing home watching the parade. She always had a shandy for her comrades. After she died, Mum and I went to the homestead to tidy things up. Family lore has it that it was built by a Swedish ship builder. What they were doing in Bonalbo in 1910 I don't know. Built in the traditional Queenslander style it was a beauty, with shady verandahs and a wide airy breeze way down the middle. Or it did. It now sits in the paddock, sagging, sad and empty. Every room, every single room was jam packed with papers. The Farm journals and shop catalogues from the 1950's were interesting. But it was the box after box after chest after chest after cupboard full to brim with precious handwritten correspondence. The whole place was a living time capsule. Some of it was moth eaten, some stained with animal faeces, some of it as fresh as the day it was written. Jean hadn't lived there for some time. They had kept everything. Shop accounts, letters, receipts, CWA and Red Cross minutes, stories and personal journals. The oldest document predated the homestead itself. Mum and I spent the following days packing and salvaging what we could. We took home 30 large garbage bages and several packing boxes of precious handwritten papers. After Jean's funeral, mum and I poured ourselves a glass of wine and gently unfolded each and every piece of paper. We'll just put it into acid free document holders and sort them later we promised ourselves. One of the first letters mum opened was from her father, to her grandfather asking for her mother's (Bettie's) hand in marriage. That was it. We were hooked. I had never known my grandfather, great uncle or other great aunt, and hadn't known Jean and Bettie for long enough. By the early hours of the morning I knew what they ate, what they drank, who they drank with and which horses they had bet on! I knew they were tardy at paying bills but enjoyed a party. It was like meeting my grandparents for the first time. They would've been about the same age as me and many of the stories contained in letters and journals reminded me of myself. It's that nature/nurture thing isn't it? A few lines. We are now in Morotia again having taken prisoners of war from Kuching English and Australians.The English were in a very bad condition and the Australians are fairly well. I think we shall be going perhaps to Bangkok and then to Singapore. I think we shall be away for perhaps until after Xmas. Is Jess home yet. Will you find out the Balt. and POW camp that Bobby Ralston, ?? ?Frazer, Mart Askew and anyone else. I have looked through all the lists. I have gone through all the wards hunting for them but so far we have not collected them. I can not tell anything about Prison Camps as yet until details are released but some much better treated than others. The Sisters shockingly treated , quite anumber were shot. 24 out of 68 (the 68 is crossed out) I am not certain of the numbers . To think I just missed Singapore by a whisker. Very hot up here. Last night Captain Phillips one of the MO’s who was at Tenterfield came over from the 2/S to see me. He came the night before last also. Quite a few people up here. I seem to know quite a number. This is a pretty island. The last one we were at was Labuam where we were not allowed to land there. Yesterday a lot of Japs came in to give themselves up, wanted food but think they were sent back , took a snap of them. Were in barges and came quite close. They looked well fed I felt.Could quite easily have a ???? bomb with them. How is Billy also Robert? What is to happening to the maize. I hope something is ??? soon as things can not go on. What precious handwritten memories do you have?? 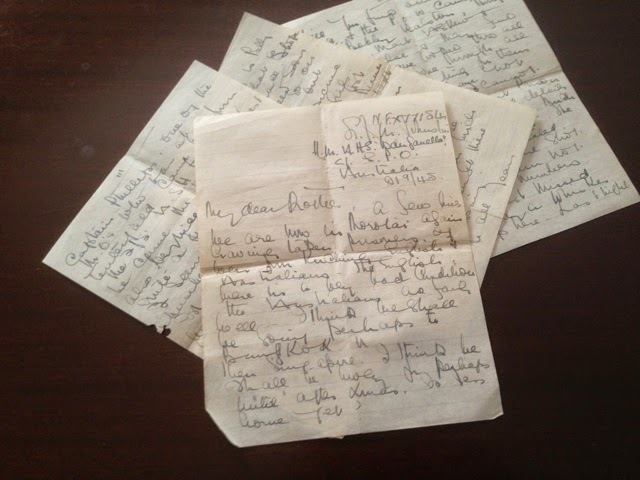 This is amazing Cat - a real piece of 'handwritten' history! Thanks. It really is something!